William A. "Big Bill" Murphy, a 28-year-old cage operator, twice successfully descended into the Belmont Mine inferno to bring confused and unconscious co-workers to the surface. Said to say "he was nearly done in," he made his third descent into the mine. This would be his last. 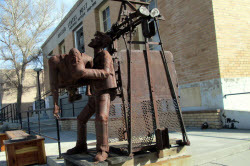 In 2006, a statue was erected and dedicated in Tonopah to "Big Bill," the hero of the Belmont Mine Fire. In a fire at this mine, 17 men lost their lives. The fire should not have been a serious one; little damage to the mine resulted. It was discovered while it was still small and was attacked for some time at close quarters, yet the unfamiliarity of the men with fire-fighting methods, together with a reversal of the air currents, permitted an insignificant blaze to develop into an appalling disaster. The Belmont mine had two shafts - the Belmont, normally upcast, and the Desert Queen, normally downcast. Smoke was first noted by the cager about 5:50 a.m. An hour or two of searching was required before the fire was discovered at the bottom of a winze on an intermediate level, which did not open into either shaft; communication was by means of the winze and two raises to the level above. The fire was burning some mine timber that had been piled at the winze bottom for distribution in the stopes. It seems reasonably sure that the fire was caused by a lighted candle or a snuff left in the timber by a man of the night shift, which had quit work at 3:30 a.m. It was decided to build a brattice in the drift and close the winze above the fire. Up to this time, dense smoke was present in only a few parts of the mine, and although the smoke issuing from the Belmont shaft prevented the descent of the men, many of them, including the timberman, entered the mine through the Desert Queen shaft. 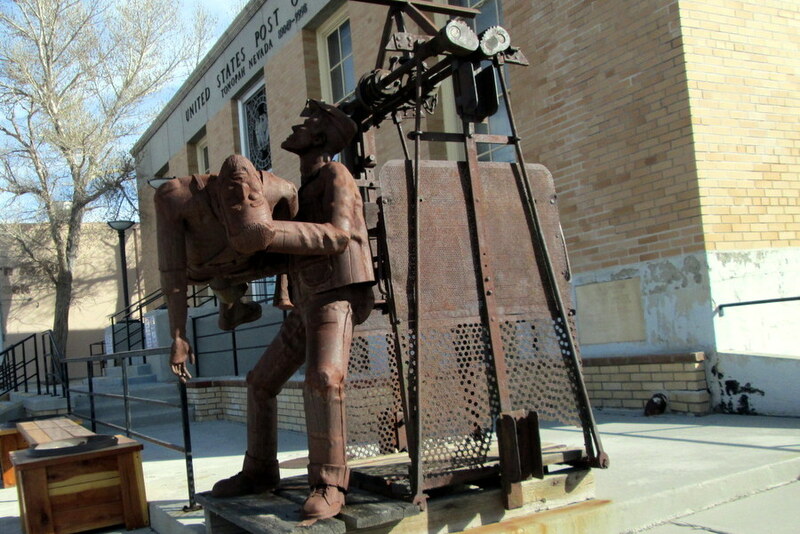 When the fire was discovered, men were detailed to withdraw everyone from the mine except those fighting the fire. The men were scattered and did not obey orders promptly; so when the disaster occurred, a good many men were underground in various parts of the mine. It is uncertain as to exactly what happened, but apparently some reversal of the air currents forced the smoke into parts of the mine that had previously been safe. The men who died were trapped at different points, several in the shaft stations, whether they had crawled from which they were unable to signal. According to one report, four men were overcome and fell off the cage while being hoisted. The fire was put out that same night by an organized party, and the bodies of the men were recovered the next morning. On the day of the fire, "Big Bill," age 28, was the cage operator at the Belmont Mine. Fire broke out on the 1166 level between 2:30 and 4:30 a.m. By 6:30 a.m., when Big Bill's shift began, shift bosses had entered the mine to determine a way to fight the fire. A group of miners were sent to explore other areas to determine the extent and fight the fire. However, some of these men disobeyed and started for the surface. In no time, thoughts of extinguishing the fire vanished as workers were literally gasping for breath, attempting to escape. As smoke filled the tunnels, panic set in among those in the mine and they made a hasty retreat to the cage. As they arrived at the surface, some were unconscious due to the toxic gases and smoke. With men still underground, no one came forward at first to descend back into the mine, not wanting to return to the hell from which they just escaped. Only "Big Bill" came forward and gave the signal to descend. He first went to the 1100 level and loaded the cage with confused and unconscious miners. After this first ascent, he helped with their unloading and descended again for a second time to bring more to the surface. Said to say "he was nearly done in," he made his third descent into the mine. This would be his last.